8 boxes per case, 24 packs per box, 9 cards per pack. Topps Heritage Baseball is back in 2019 and this year, we will be celebrating the 1970 Topps Baseball design. Current stars, MLB legends, and rookies are showcased on these classic cards. Highlights of this set include Real One Autographs and Clubhouse Collection Relics! Base Cards: Showcasing 500 veterans and rookie players in the 1970 Topps design. Collect all 100 High-Numbered Short-Printed cards. Base Card Chrome Parallels: Base Card Chrome Variation100 subjects from the Base set showcased on Chrome technology. Chrome Refractor Parallel: #d to 570 -Chrome Black Bordered Parallel: #d to 70 -Chrome Superfractor Parallel: #d 1/1 Base Card Mini Variations: #d to 100 Base Card Variations: Silver Metal Base Variations #d to 70. Autograph Cards: Real One Autographs Retired and active players sign ON-CARD autographs in blue ink. Select cards will feature players that had appeared for the last time on a Topps card in 1970. Real One Special Edition: hand #d to 70 or less. Inaugural Brew Crew Autographs Retired players from the debuting 1970 Milwaukee Brewers sign ONCARD autographs. Stamps and Cut Signature Cards 1970 U. 1970 Baseball Cut Signatures: Featuring players who made the news in 1970. 1970 Celebrity Cut Signatures: Featuring musicians and celebrities that were popular in 1970. Relic Cards Clubhouse Collection Relics: Uniform and bat relic cards of active stars. Gold Parallel: #d to 99 Clubhouse Collection Dual Relic: Dual uniform and/or bat relic cards featuring retired and active players. Clubhouse Collection Triple Relic: Triple uniform and/or bat relic cards featuring retired and active players. Clubhouse Collection Quad Relic: Quad uniform and/or bat relic cards featuring retired and active players. Clubhouse Collection Autograph Relics: Uniform and bat relic cards to be signed on-card by active and retired players. Hand-numbered to 25 or less. Flashbacks Autographed Relics: Featuring key highlights from the 1970 season from retired subjects. Insert Cards New Age Performers: Top current players whose performances have eclipsed the greats of the past. 1:12 packs Then and Now: Statistical comparisons of a 1970 player vs. Baseball Flashbacks: Flashback highlights from the 1970 season. 1:20 packs News Flashbacks: World news moments from 1970. 1:20 packs 1970 Topps Scratch Offs: Replicating the 1970 Scratch Offs. 1970 Player Story Booklets: Replicating the 1970 Player Story Booklets highlighting top superstar players. Product is scheduled to release on 3/06/19. The item "2019 Topps Heritage Baseball 24 Pack 8 Box Case FACTORY SEALED PRESALE" is in sale since Tuesday, January 15, 2019. This item is in the category "Sports Mem, Cards & Fan Shop\Sports Trading Cards\Baseball Cards". 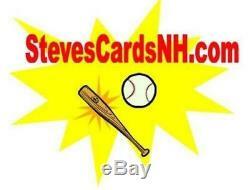 The seller is "stevescards" and is located in Salem, New Hampshire. This item can be shipped to United States, Canada, United Kingdom, Denmark, Romania, Slovakia, Bulgaria, Czech republic, Finland, Hungary, Latvia, Lithuania, Malta, Estonia, Australia, Greece, Portugal, Cyprus, Slovenia, Japan, China, Sweden, South Korea, Indonesia, Taiwan, South africa, Thailand, Belgium, France, Hong Kong, Ireland, Netherlands, Poland, Spain, Italy, Germany, Austria, Bahamas, Israel, Mexico, New Zealand, Singapore, Switzerland, Norway, Saudi arabia, United arab emirates, Qatar, Kuwait, Bahrain, Croatia, Malaysia, Brazil, Chile, Colombia, Costa rica, Panama, Trinidad and tobago, Guatemala, Honduras, Jamaica, Barbados, Bangladesh, Bermuda, Brunei darussalam, Bolivia, Ecuador, Egypt, French guiana, Guernsey, Gibraltar, Guadeloupe, Iceland, Jersey, Jordan, Cambodia, Cayman islands, Liechtenstein, Sri lanka, Luxembourg, Monaco, Macao, Martinique, Maldives, Nicaragua, Oman, Peru, Pakistan, Paraguay, Reunion, Viet nam, Uruguay.